This cajun chicken bake is weeknight meals done right. Everything goes in at once, you bake it, eat it, then wash one pot. Easy. 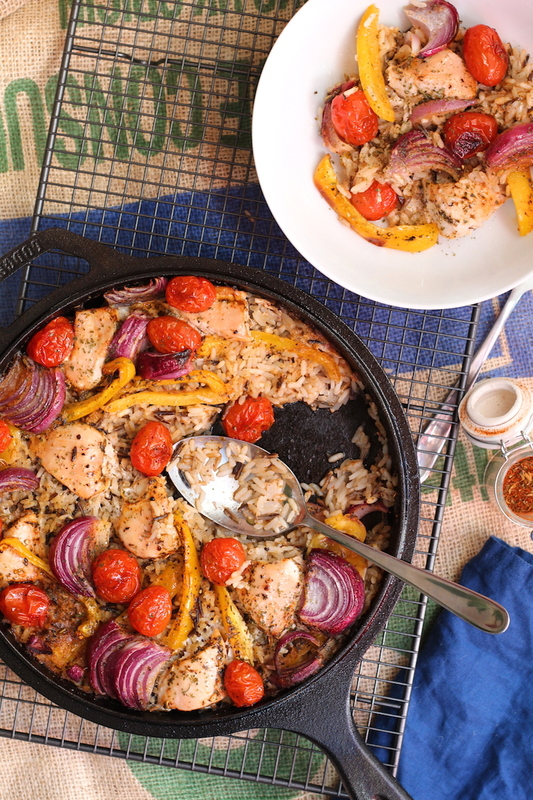 We make lots of meals in our house where there’s just one thing to wash at the end of it, like my pancetta, butternut and wild rice skillet recipe and this cajun chicken bake. I put that down to having grown up with a dishwasher and suddenly finding myself in my own house without one. Quite simply, I’ve been spoilt. There’s a lot of appeal in a one pot/pan/tray meal when you’re washing up by hand. If I get my own way, we’ll have a dishwasher soon but for all my fellow hand washers, I get it. We spent yesterday afternoon in Ikea looking at kitchens and dazzled by all the options. Matt was lusting after stainless steel and fancy extractors and I was sticking to my fitted dishwasher ideals. After realising we liked the most expensive options in worktops and doors, we called it a day and headed home with a stack of catalogues. If you have any advice on choosing your first ever kitchen, please leave a comment below because we’re struggling with this! Until we decide and until we have a dishwasher, one pot meals will be our mainstay. I’m looking at you cajun chicken one pot bake. Tender, succulent chicken on a bed of perfectly cooked rice, onion, tomatoes and peppers, all with that amazing deep south cajun flavour. The dish creates its own sauce with the burst tomatoes, spices and the juices from the chicken. I’ve used the dusting technique to thicken that up and make it more of a coating for the rice which I think works really well. You can read more about the technique and how to properly thicken things with flour here. I’m using my own cajun seasoning mix in this recipe which you should definitely try out when you get time. If you’re in a rush though, store bought cajun spice will do the job. Give this cajun chicken one pot recipe a go and let me know what you think in the comments. Preheat the oven to 190 degrees C (375 F). In a large oven proof dish, tray or skillet, mix together the cajun seasoning, flour and rice. Add the water and stir well, ensuring all the rice is immersed. Cut the onion and pepper in to long strips. Scatter the onion, pepper, chicken and tomatoes over the top of the rice. Seal tightly with a tinfoil lid and bake for 35-40 minutes or until the chicken and rice are cooked. This looks so good! I’d love to try a vegetarian version of this recipe! this looks really good, and easy. will try this sometime this week and post a result…..
Get a dishwasher. I was one of those ‘no point and its waste of leccy’ sorts so didnt get one when we put our kitchen in, regretted it ever since. I’ll be showing Matt your comment tonight for sure! The kitchen company we’re thinking about buying from have an offer on this weekend where the dishwasher is only £49… surely that’s a no brainer? WHAAAAAAAAAAAT? Thats the entire next level from no-brainer, whatever that may be! Made it last Saturday night. Great tasting and good looking dish. Thanks !! Lovely tasty dish and so easy to make. Think this will be a regular tea for us. It smells gorgeous…..but it’s been in the oven for about 3 hours!! Oh my! Something certainly went wrong there as the recipe has been tested by both myself and many readers. Did you use ‘easy cook’ rice as the recipe states?